1 & 2. When it rains it pours! I'm so happy to help get the word out about Christine Schmidt's (of Yellow Owl Workshop) first SF solo show. The show is titled "OF NOX NOCTIS / OF NIGHT" and will consist of a series of cyanotype prints of drawings exploring real and imagined night scenes. It starts today at The Candystore Collective, 3153 16th Street, San Francisco, CA 94103. The opening is from 6-9 and runs through January 21st. 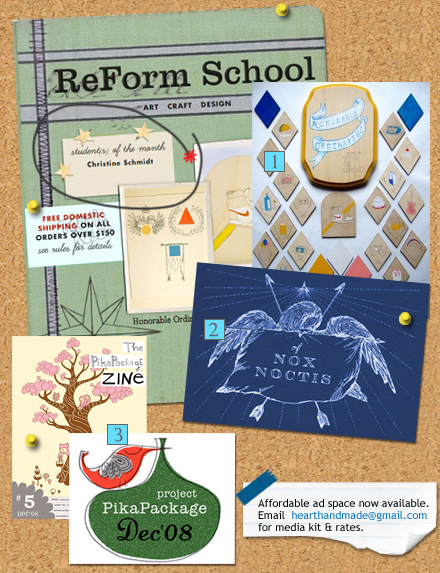 She's also the student of the month over at Reform School - She created a show called "Honorable Ordinaries," an installation of original one of a kind drawings on wood and an accompanying exclusive print. And if that wasn't enough good news... she's also in this month's ReadyMade!! 3. If you haven't yet, please make sure you check out this month's PikaPackage. And be sure to download the zine or preview it here. YAY! I love Christine and her work! Congratulations Christine !